Koriyama Castle (郡山城) was built in 1162 by Tsutsui Junkei. And reconstructed by Toyotomi Hidenaga in 1585. Hidenaga moved all of the market and stores from Nara to Yamato to develop a major city. There are many ruins such as stone wall and moat, and the gates, keeps and houses are reconstructed recently. Today, the castle is chosen as one of the 100 best Hanami spots in Japan. There is no parking. Admission free. 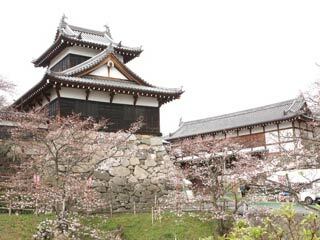 Koriyama Castle was ruled by Toyotomi Hidenaga and after fall of Toyotomi clan, the castle was the government of Koriyama han. During Tsutsui Junkei (1571 to 1584), he started modern style of castle with town under the order of Akechi Mitsuhide. After his death, Hidenaga moved this castle and started to build the huge castle for 1 million koku. Because Yamato didn't have much stones, he had to use many stones from temples. There is one Jizo stone under Tenshu wall, called Sakasa Jizo. He built many baileys and also form the huge castle town. This was because he thought this is the very important castle to protect Osaka Castle. Hidenaga moved all of the market and stores from Nara to Yamato to develop a major city. After death of Hidenaga, Tsutsui clan moved back by the order of Tokugawa Ieyasu. However, it was defeated by Toyotomi Hideyori. After the battle of Osaka, Matsudaira clan and Honda clan moved here and ruled until 1724. Then, Yanagisawa Yoshisato moved from Kofu, and ruled until the end of Edo period.